My Savvy Life This Week - Don't be a Deal Hog! As I was shopping over the weekend I saw a lot of Savvy Shoppers with "binders" full, and even overflowing with coupons. (I like to call my binder a coupon portfolio - because it's an investment portfolio of sorts, a portfolio of savings!) I was in the process of checking out when a fellow Savvy Shopper got behind me in line. We discussed all the hot deals and freebies we were getting and she mentioned that she wanted to stock up on Maalox, but the store had been out every time she came in. She said, "I don't want to buy it because I need it. I only want it because it's free and I can make an extra dollar if they give me the overage!" Buying things you don't need is not only a waste of your time, it's a waste of other shoppers time who actually need that product, but can't find it because it's been cleared off the shelf by someone who won't even use it! As an example, on a weekly basis diabetic testing equipment is free, plus frequently a money maker, with local drug store deals. Does that mean you buy 10 packs of testing strips just so you can make a little money? Truthfully, some of you will say yes. I know there will be some opposition to my thoughts on this subject and that's fine. But, when my dad, who is diabetic, runs in to the store to grab some strips and they're taken by someone with no use for them, it's frustrating! I get that we might be able to make a dollar or two by buying products with little use for our families, but our own personal storage space is worth something too. Clutter filling our storage shelves is a waste of precious organizational space (that's my OCD talking). Besides, wasting product, in my humble opinion, shows a lack of respect for ourselves, stores and their customers. In a similar situation, I was reading another blog post about whether it was ok to empty blinkie coupon machines or take entire stacks of tearpad coupons from stores. Surprisingly, to me anyway, the majority of comments stated that they felt it was just fine to empty blinkie machines and grab any and all coupons they could, regardless of others. "As long as I will use the coupons, I'm taking them all!" one commenter responded. You know what, this is why couponers get a bad rep. We're often thought of by "non-couponers" as being willing to do anything for a buck, whether it's nice or not, because we're simply out for ourselves - to heck with the rest of the world, you're on your own. "If I'm "smarter" or faster on the draw than you, then I guess you're just out of luck." I guess I just don't like to coupon with an every man for himself kind of attitude. And I'm no Mother Teresa either! Believe me, I love free stuff and if I see it and need it and there's only 3 left on the shelf, I'm buying all three - especially if it's a clearance deal and won't be restocked - watch out! But I'm buying them, because I need them and my family will use the product. Buying in reasonable numbers helps ourselves and helps others. Hurry and check your Kraft First Taste account! I just got a FREE Kraft Cooking Creme coupon! These go really fast, so I'd jump on it! Survey Websites: Survey/research websites are popping up by the minute. These sites allow you to communicate with other users in blog style posts to share your opinions on specific brand name products and campaigns. The best part? 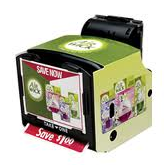 You get to try the products for FREE through coupons, samples and other exclusive offers. A few of my favorites survey sites are www.VocalPoint.com and www.KraftFirstTaste.com. New trial offers are posted regularly with free product coupons sent to your home, plus extra high value coupons meant to be shared with friends and family or even samples in the mail! The catch, and it’s only a small one, they ask you fill out a brief survey after trying the product and share your experience through trys and tells. By helping spread the word about new products and brands you’ll be the first to taste test new products and all at no expense to you! Signing up for these community trial programs is a savings worth trying! As I was reading all the blog posts this week about how cheap/free Gain Fabric Softener will be with the $3.00 coupon that came in the Sunday Newspaper, I had to laugh a little. It was funny to me that so many shoppers intended to buy only the packages that were completely free. 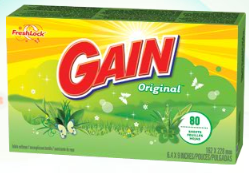 As an example, Family Dollar has a 60 ct Gain Fabric Softener sheet package for $2.99 - $3.00/1 coupon = FREE. While my Walmart has a 80 ct Gain Fabric Softener sheet pack for $3.52 - $3.00/1 = $0.52. A friend called me and asked me where I thought she should use her coupon. I told her that instead of opting for totally free I would buy the Walmart sheets. Why? Because she could get 80 sheets for only "$0.52 per box"! If she has a limited amount of coupons (which we all do) and is looking to fill her laundry storage, the smartest idea would be to maximize the product purchased and thus maximize her savings! That may sound weird coming from me since Free is my favorite word. But you never know when fabric softener will be free/cheap again and stocking up at $0.57 for 120 count is an AMAZING DEAL. Even if it went completely free before the coupon expired it would STILL be an amazing deal. And as many of you know (Electrasol Tab coupon users), the free packs always go first and often remain unstocked for the duration of the coupons expiration date. Sometimes you have to take what you can, and in this case bigger is better in my opinion! A Savvy Tip: Walmart Coupon Policy - Does Walmart Take Other Stores Coupons? There have been a lot of questions lately as to Walmart's coupon acceptance policy, especially when it comes to whether or not they will accepts other store's coupons, so I thought I would explain it for you. Must be legible, have "Manufacturer Coupon" printed on them, have a valid remit address for the manufacturer, valid expiration date, and have a scannable bar code. 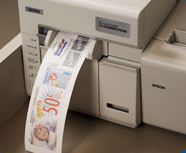 (also called "Catalinas") that are printed at our competitors' registers, have "Manufacturer Coupon" with specific requirements printed on them, a valid remit address for the manufacturer, valid expiration date, and a scannable bar code. Walmart only accepts coupons for merchandise that we sell. While you may think that accepting other store's coupons is relatively new to Walmart it's actually not. Walmart has accepted coupons from competing grocery and retail stores for as long as I can remember. That being said, what does it mean that Walmart accepts "Store Coupons"? It simply means, if it scans, Walmart will accept it. In order for it to scan it therefore would need to be some type of manufacturer coupon. Store coupons accepted include: Walgreens Register Rewards, Target Manufacturer Coupons and manufacturer Catalina Coupons from any store as long as they have a barcode. Store Coupons NOT accepted: Rite Aid Up Rewards, Lowes Store coupons, etc. These coupons are not manufacturer coupons, but rather the bar code is specific to the store and will not scan. It's easy to see by just looking at the bar code that it looks completely different than a normal mfr. coupon bar code. Just remember: If it scans, you can! Hopefully this helps you understand the Walmart store coupon policy. As a note: Walmart DOES NOT price match Walgreens sale prices which include Register Rewards in the pricing or Rite Aid sale prices which include Up Rewards in their pricing. You may not know that Valentine's Day is also Congential Heart Defects Awareness Day. Congenital Heart Defects (CHD) are birth defects of the heart that affect millions of newborn infants and children worldwide; a killer that claims thousands of lives every year. Eight of every 1000 children born alive will have some form of congenital heart defect. On February 14th, A DAY FOR HEARTS, a concerted global effort is made to heighten awareness of this deadly group of diseases. Sitting in the cardiologists office 2 weeks later I was left staring in tears at model hearts and graphic depictions of what I then believed was a death sentence for my baby. I didn't want to touch her, hold her, or love her because I was going to lose her. However, we have been overwhelmingly blessed. Her heart has not changed much in the last years of her life and surprisingly she has not required any medication or surgeries yet, though they will be coming. I can't tell you how many times I have climbed into bed next to her while she was sleeping and weeped at her side. Weeped for the broken heart I gave her and for not being a better mother. I try not to coddle her, but treat her as a normal child with an extra special heart. 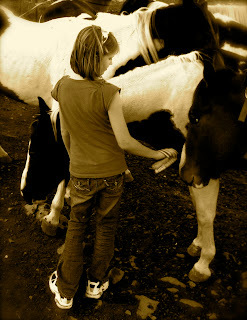 We've explained to her what will happen in simple terms and that one day her little broken heart will need to be fixed. All that concerns her for now is that she can be asleep when they fix it. I will cry next to her then too. You know he REALLY loves you if.... He buys you $1300.00 Roses! Seriouly, Walmart has quite the deal on roses this year ;-) My mom was standing in line behind a young husband buying all kinds of sugar cookies, stuffed animals and other V-day accoutrements this past weekend. She smiled at the piles of "love" he had crammed into his cart. As he began to check out, he ran to quickly grab a dozen roses. The checker scanned the roses which rang in at $1300.00!!!!! Ok, clearly there was a pricing error and the checker called the manager over to fix the issue (it had been happening all day, the manager said). Can you imagine if this gentlemen wasn't paying attention or even, possibly too nervous to speak up. Though seriously, who wouldn't speak up - or even yell loudly in that moment. Well, it is that day once again, you know the spending too much money on flowers, dinner and other non-essential gifts day to prove one day a year how much we truly love our partners! Now don't get me wrong, I love Valentine's Day and I love my husband, but I also love that we don't have to prove that to each other just one day a year, and we don't have to prove it by buying gifts! We love having a low key, low cost Valentine's Day. In fact, this year I asked that my husband not spend ANY money on Valentine's Day, other than some takeout (probably a $5 footlong Subway and free cookie) and the notoriously FREE Valentine Red Box with code: BEMINE. Actually, one of my fondest Valentine memories growing up is of my mother leaving small heart shaped boxes of chocolate candies on the end of my bed each Valentine Day. It cost her less than a dollar, but I knew through this small token that she loved me and it's a tradition I have also adopted for my own children. It's the small things, the tokens, the service, the smiles that show our loved ones how we really feel. Overspending just because we feel obligated to buy a $5 Hallmark card is not only unnecessary, but even wasteful in my opinion. 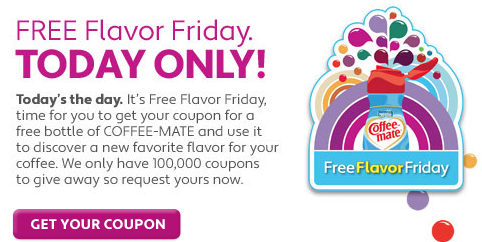 I love that Redplum.com released some beautiful FREE IOU coupons today so that you give service as a gift. It's an inexpensive, yet meaningful gift. You'll laugh, but my gift to sweet Macgyver this year is a free 30 day Netflix trial. Told you, you'd laugh. He's been wanting to try Netflix forever and I have been hesitant. Being semi-computer illiterate, the only way he would ever get to try it out would be for me to set it up. I printed out the confirmation and handed it to him this morning. You should have seen the smile on his face!!! I'm so glad that for him it's the little thoughtful things that matter! If you're new to Disney Reward check out my Disney Rewards How To and see if any of the additional codes listed will work for you! I love, love, love FREE MP3 downloads. Amazon.com offers thousands of free downloads and albums daily, but they aren't always the hottest artists or songs. So I watch for free amazon codes or special track offers that come up regularly. 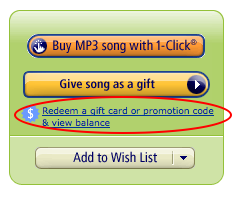 The latest freebie is a $2 Amazon.com credit, which means 2 free songs for my ipod! I used the $2 code: VDAYMP3S and picked two $0.99 tracks (Black Eyed Peas - Dirty Bit and Neon Trees - Animal) for FREE! You can use this code today through February 15th! I have to admit the first few times I used (or rather tried to use) a free Amazon code I failed miserably. Why? Because no one told me I had to add the code before I bought the song. I thought I would get to add the code at checkout - WRONG! I ended up paying for the first few songs before my credit ever took effect. So, if you want to ensure you get your songs for free, make sure after you click on the song you want (sample page), that you add your code before you buy the MP3! 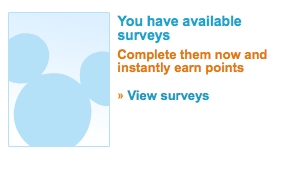 Are you a Disney Rewards Member? It is so easy to get rewarded! 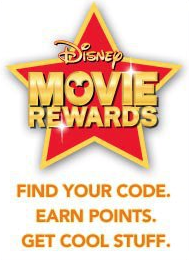 It takes very little time to enter codes and the rewards available are easier to reach than even Pampers Codes, especially if you buy Disney DVDs regularly like me! Once you've accumulated enough points you can earn awesome rewards for kids and adults, like FREE DVDS, limited edition artwork & more! At this point I'm hoping you've received lots of Facebook coupons, free samples and even full size FREEBIES! It's so fun getting deals on Facebook and I'm totally addicted. This week I got in on the FREE Clairol Hair Color, even though I don't dye my hair yet (for my sis), the $7.00 KY coupon, a FREE Voskos yogurt coupon, a FREE Cheez It Sample, Trying to get FREE Coffeemate right now, I won a FREE Downy Sleep T, got a FREE Origins Sample and so many more Facebook deals I can't list them all! There are free coupons and samples on facebook literally every single day, but have you ever paid attention to the fact that many of these Freebies require you to give these companies access your Facebook page/friends/posts? 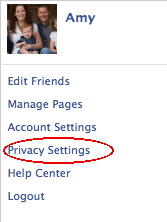 Many Facebook freebies require you allow access to an application (app) and agree to let manufacturers post updates on your wall or access other personal information. Remember when I said last week, "Freebies aren't really free"!?! Here's a case where you have to give away part of your personal information as "payment" for a free sample. But, did you know you don't have to continue to allow these apps to have, sometimes, unfettered access to your personal info after you get the sample or coupon? If you've signed up for multiple Facebook offers and want to remove app access follow these easy instructions and restore your privacy!